If we want to relax and unwind, we put on something comfortable, such as a big jumper, baggy pants or even our nightwear. 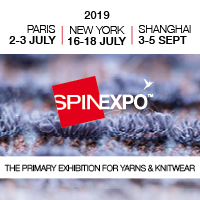 The pyjama look has been popular for wearing as daywear for some time now, and is inspiring creative designers in the fashion sector to come up with hybrid styles that are invigorating the market, according to leading warp knitting machine manufacturer Karl Mayer. ‘Sloungewear’ is one of the latest products to emerge from this imaginative crossover sector – its comfortable, on-trend clothing that combines leisurewear with nightwear. This mix of styles starts with the design, as illustrated by the set shown on this page. The top and shorts set combines the styling of pyjamas with a pattern typical of outerwear and the all-over lace was produced on a LACE.EXPRESS. It features floral motifs in a geometric arrangement and a large, striking pattern, which can only be produced on machines having a large number of guide bars. An OJ 83/1 B with a gauge of E 24 was used to produce it. The flexible, multibar raschel machine worked a ground featuring a variety of patterns next to each other, comprising open, organic structures and filigree mesh areas. The contrasting effects in the ensemble are enhanced even more by using matt, textured and untextured, shimmering polyamide. The eye-catching, dynamic look was designed by Neil Thorpe and Karl Mayer collaborated with the Chinese company yarn supplier Dongyang Hongji Industry.